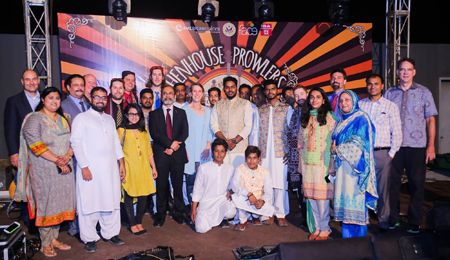 We are pleased to share that IBA in collaboration with the US Consulate General in Karachi organized a music concert by the American bluegrass band, Henhouse Prowlers on Thursday, April 13, 2017. The event started with Dr. Sayeed Ghani's (Acting Dean & Director, IBA) opening remarks. The band was introduced by U.S. Consul General Grace Shelton who told us how excited she was to present the American's homegrown music traditions. The Henhouse Prowlers have gained a reputation for their highly original, tradition-inspired bluegrass built on a strong foundation of intricate harmonies and electrifying stage energy. The band sang a few songs that were more related to the genre of country music. Henhouse Prowlers also paid tribute to Junaid Jamshaid by singing "Dil Dil Pakistan" which was a real treat for the audience. There was a performance by Hamza Akram Qawwal & brothers, who belong to an illustrious family of Qawwali and Classical music, are known for traditional classical qawwali as well as fusion. Later, the band collaborated with Hamza Akram Qawwal and performed a fusion of bluegrass music and qawwali, as the idea was to mix with the artistes in Pakistan, exchange ideas on diverse music and cultures. The audience was truly mesmerized with the performance on the whole.